A very special area, England’s smallest National Park. William the Conqueror decided in 1079 he would have a hunting forest. What he did to protect it is still the way it is done today – nearly 1000 years later. His legacy is priceless. Before you leave on your day out ask for the New Forest Breakfast at your B&B – delicious breakfast with all local produce! Well why not – you can work it off cycling! Cycling, walking and horse riding trails cover the forest. 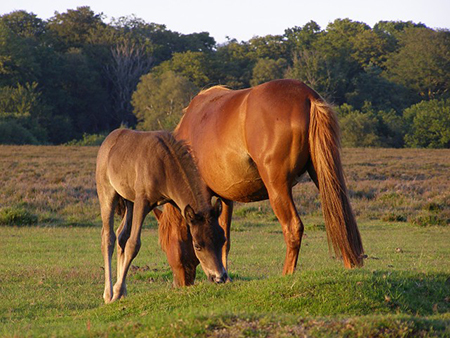 See the ponies, watch the wildlife in the heathlands and the woods and just relax in such peaceful surroundings. Part of the NCN2 starts and/or finishes in the New Forest. It is not completely connected up yet, but this part of the NCN2 from Southampton to Lyndhurst is. Eventually this route will run all the way from Kent to Cornwall. Route 1. Almost four miles. Start and finish at the Dearleap car park which is a couple of miles from Ashurst and near the New Forest Otter, Owl and Wildlife Park. Route 2. Parking is limited here. Three and half miles. Starts and finishes just over half a mile from Ashurst in Woodlands Road. Route 3. 7 miles, all off road. Starts and finishes at Tilery Road Car Park just over a mile north east of lovely Brockenhurst. Sometimes the very shy New Forest deer can be seen. Route 4. 5 and half miles, all off road. Starts and finishes at the Hawkhill Car Park which is nearly four miles of Brockenhurst and nearly three miles west of Beaulieu. Lovely countryside. Route 5. 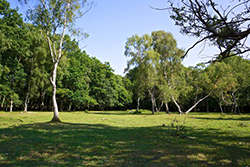 7 miles, not all off road, there is a short stretch along Rhinefield Road.Starts and finishes at Beachern Wood car park which is just over a mile west of Brockenhurst. Route 6. 4 miles. This may not be long, but it is much tougher! A steep hill and a short stretch of road. A crazy figure of eight. Starts and finishes at Stoney Cross Plain car Park a mile and half south east of Fritham. Route 7. 8 miles. Moderate level of ability, it is a bit hilly. Starts and finishes at the Millyford Bridge car park which is two and half miles west of Lyndhurst. Over half a mile is along the very busy A35 so this one is not for children. Attractive though it goes along a bit of the Bolderwood Arboretum Ornamental Drive. Route 8. 5 miles not all off road. Starts and finishes at Lucy Hill car park which is one and half miles north east of Burley. Woodland. Route 9. Not quite three miles all off road, but some short, sharp hills, so one for the fit folk. There are some seats along the way!!! Starts and finishes at Wilverley Plain car park which is nearly four miles south west of Brockenhurst and just over four miles south east of Burley. Route 10. Six and quarter miles. Not all off road, but quiet roads. Starts and finishes at Milkham car park which is northeast edge of Milkham Inclosure. 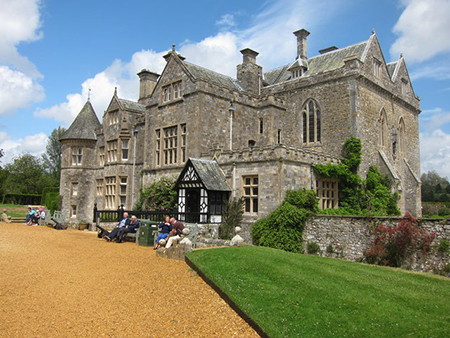 Descriptions of these delightful routes can be found at the New Forest Explorers Guide. Or you might prefer to browse some more, please do, there are navigation buttons above on the left for your enjoyment.